Home / Opinion and Issues/ Disqualifying twice-elected presidents: A failed endeavour? Disqualifying twice-elected presidents: A failed endeavour? 1.The 19th Amendment, by repealing and replacing Article 3 of the Constitution, abolished the existing office of President and replaced it with a new office of President. 2.The powers, functions and duties of the new office of President are fundamentally different that those of its predecessor. Under the new Article 33, the President was intended to be “the symbol of national unity”. Inexplicably, the Supreme Court rejected that description as being unconstitutional, the reason being that in 1981 the then Cabinet of Ministers had “categorically stated that the National Flag is the symbol of the unity of our People”. The national flag is referred to in Article 6 of the Constitution and depicted in the Second Schedule, with no reference whatsoever to it being the symbol of national unity. This was perhaps the first occasion when the Supreme Court elevated a cabinet decision to the status of a constitutional provision. Be that as it may, the new Article 33 also requires the President, inter alia, “to respect and uphold the Constitution”, “to promote national reconciliation and reintegration”, and “to ensure the creation of proper conditions for the conduct of free and fair elections”: duties and functions which were not previously required. The office of President established by the 19th Amendment is fundamentally different from its predecessor. The President now cannot appoint or remove Ministers and Deputy Ministers except on the advice of the Prime Minister. His power to remove the Prime Minister from office was expressly repealed. In making appointments to the high offices of the State, including Judges and the Attorney General, and to all the Independent Commissions including some that were newly constituted, he is required to act on the recommendation of the 10-member Constitutional Council to which he may on his own appoint only one member. The President’s power to dissolve Parliament may be exercised only on the request of two-thirds of its members, except during the last six months of its five-year term. He no longer enjoys immunity from judicial proceedings, and any person may now challenge his official acts or omissions in the Supreme Court. Indeed, the new duty imposed on him to ensure the creation of proper conditions for the conduct of free and fair elections suggests that he should not be actively involved in any political party contesting such elections. Despite the few residuary powers which he retains, such as appointing Ambassadors, Ministry Secretaries and Governors of Provinces, the office of President established under the 19th Amendment is now more in the nature of a constitutional Head of State. 3.That the two offices of President are distinct and separate from each other is also evident from the transitional provisions. This transitional provision became necessary because the offices which Maithripala Sirisena and Ranil Wickremasinghe held since January 2015 had ceased to exist when Article 30 and Chapter VIII of the Constitution were repealed. The offices of President and Prime Minister established by the 19th Amendment were new offices, and it was therefore necessary to provide for these two persons to continue to function in these new offices, but subject to the reallocation of powers introduced by the 19th Amendment. The significance of this reallocation is evident from an unprecedented provision, section 51, in the amending Bill. It stated that, notwithstanding anything to the contrary in the Constitution, President Sirisena may also serve as the Minister of Defence, Mahaweli Development and Environment. No person had previously been appointed a Minister by an Act of Parliament. 4.The disqualification is only applicable to the office of President established by the 19th Amendment since it was not applied retrospectively to those who had been twice elected to the office of President that was abolished by the 19th Amendment. Whether advisedly or inadvertently, Parliament did not provide in the 19th Amendment for this new constitutional disqualification to retrospectively apply to citizens who had previously been twice elected to the former (since abolished) office of President. A law is not considered as imposing a disqualification retrospectively unless Parliament had clearly stated that to be its intention. 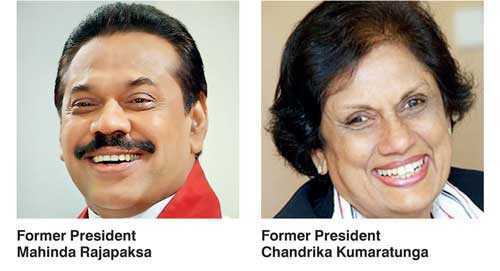 Accordingly, it would appear that the two surviving former Presidents, Chandrika Kumaratunga and Mahinda Rajapaksa, not having been made subject to this disqualification, are eligible to seek election to this new, essentially non-executive, primarily symbolic and ceremonial, office of President whenever an election is held.